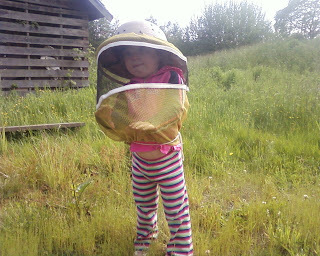 When I wrote about beekeeping with children for Parentables, I noted that bees can be a fantastic tool for encouraging emotional literacy. 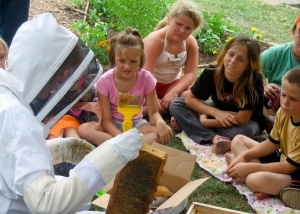 For the same reason that beekeeping is great for those with felony convictions, it can also help children to better understand and control their anger and improve their behavior. As any beekeeper will tell you, opening a hive when you are in a bad mood is a very silly idea. 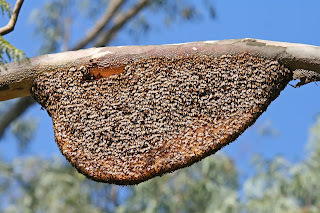 One UK school is finding this out in very practical terms, having gone from trying to remove an uninvited swarm, to adopting a school hive of its own. While revenue from honey sales is a welcome boost, it’s the improvement in unruly kids’ behavior that has been most striking. As a species, we’ve co-evolved with bees for thousands of years. So its little wonder that reconnecting with some of our closest non-human partners does both parties a whole lot of good. As a failed beekeeper with a young toddler, it will be a while yet before I introduce my own brood to the world of bees. But I do have a friend who regularly visits his hives with his young son and daughter—they’re pretty well behaved kids already, but experiencing bees close up is an awesome educational opportunity. I only wish more kids had the chance.